All of the following restaurants are located on Stocking Island which can be reached via a 35 minute drive from Casa Del Mar + a 20 minute water taxi ride from the Government dock in George Town; Taxi $30 each way to Georgetown plus $12 per person round trip water taxi. Be sure to tell the water taxi driver which restaurant you are headed to. Very popular Bahamian restaurant known for it’s freshly made conch salad, colorful exterior, beach side location and laid back atmosphere. Their menu features burgers, grouper fingers, whole snapper and other popular local fare. Full bar. 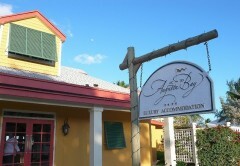 This is the spot to go on the weekends for an authentic Bahamian buffet lunch. The open air restaurant is located on a beautiful, quiet beach, and the owners, Elvis and Maryanne offer up warm Exumian hospitality to go along with their delicious food. Buffet – $20 per person. On request and with advanced reservations, they will accommodate larger parties for dinner during the week. Another great, casual beachside location. They offer local and American cuisine. 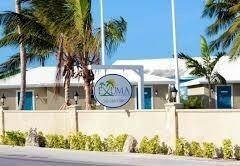 Exuma Kitesurfing operates next door so you might be able to catch a show. Open daily. Breakfast 7.30-11.00am; lunch 12.00pm-5pm; dinner 6.00-9.00pm. Bahamian Dinner night on Tuesdays, Island BBQ & Junkanoo Bonfire on the beach on Thursdays. Dinner reservation is required! Can be closed during low season in September-October. 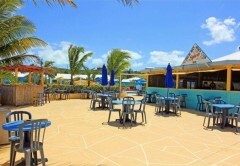 Newly reopened restaurant in the Exuma Palms Hotel on Three Sisters Beach. Their menu changes often but generally features European and Asian inspired options. Full bar. Located off the beaten path on the south side of the island, Catch a Fire is one of the best places to watch the sunset while enjoying a tropical drink. They offer live Rake N Scrape music on Wednesday and Saturday nights. Please note that service times can be quite long especially on the nights that live music is offered. Be sure to get directions from the Concierge if you will be driving to the restaurant on your own. Full bar. Great little sports bar located just outside of Georgetown. They offer typical sports bar fare—pizza, hamburgers, hot dogs, etc. Enjoy a game of pool while you wait for your food or catch your favorite sports team on one of their televisions. Full bar. The newly renovated hotel and restaurant offer a great indoor or outdoor dining experience on Elizabeth Harbour. Their international cuisine menu features steak, chicken and seafood as well a full bar and bar menu. Indoor (air conditioned) dining overlooking their pool and Elizabeth Harbour. 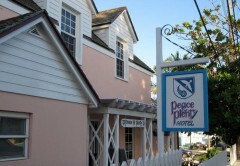 They serve a mix of Bahamian and International cuisine. On Friday nights they offer a buffet for $25 per person. Full bar. The Fish Fry is a collection of informal beach huts just north of Georgetown. As the Lonely Planet guide explains “Definitely a local experience, this slice of island life may be a bit raucous for some, but it’s one of the best opportunities you’ll find on the island to mix with locals.” Some of our favorite vendors include Honey Dew, Charlie’s, and Poorman’s Kitchen. The restaurant and bar is located in the historic Club Peace & Plenty hotel in downtown Georgetown just past the Straw Market. A long time favorite of many winter residents and boaters. They offer indoor and outdoor dining (Bahamian and international cuisine), and are known for their parties on Friday nights. Full bar. A quaint cafe located across the street from the Government Administration Building. They offer breakfast and lunch daily. Great sandwiches and salads along with fast and friendly service. 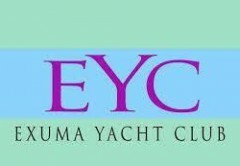 Located on the water just before you reach Exuma Market. Look for the gas station signs. The restaurant and marina are owned by former Formula One race car driver, Eddie Irvine. Indoor and outdoor dining and full bar. Primarily Italian and American food, but the menu has been evolving. 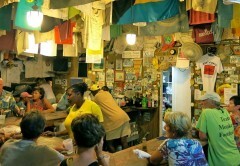 Local Bahamian fare is served at this simple roadside eatery. The menu changes daily, but is always delicious. To reach the restaurant go past February Point about 1/2 mile; located on the right-hand side of the road. This is one of the newest restaurants on the island and boasts an exceptional menu featuring a revolutionary mix of flavors from Peru, France, Asia, as well as some Bahamian fare. Full bar with inventive cocktail menu. Great waterside location and awesome sunset views. Prices are on the high end. See www. Turquoisecay.com for a sample menu. Open daily (but vary) 11.30am-until last guest. 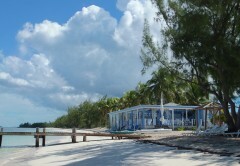 A newcomer to the Exuma beach bar / restaurant scene. The little outdoor restaurant sits atop a slight hill overlooking the ocean. The young Exuma born chef is a Le Cordon Bleu graduate who brings his blend of Asian and French techniques to popular Bahamian favorites. The good, friendly service combined with flavorful dishes have earned this bar & grill top TripAdvisor ratings. 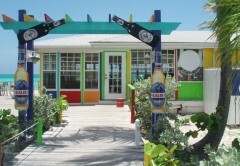 One of Exuma’s most popular eateries. This casual beach side hut serves up probably the most reasonably priced lobster dishes on the island (the owner’s husband is a fisherman!). It’s a great spot for lunch followed by a trip to Tropic of Cancer beach (ask the folks at Santana’s for directions) where you can relax while still savoring memories of your meal. Located right next door to Santana’s. 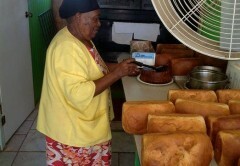 They offer freshly baked breads, rum cakes and other delectable goodies. The lovely smell of baked goods alone will draw you in! All of the following restaurants are located on Stocking Island which can be reached within a 35 minute drive from Casa Del Mar + a 20 minute water taxi ride from the Government dock in George Town; Taxi $30 each way to Georgetown plus $12 per person round trip water taxi. Be sure to tell the water taxi driver which restaurant you are headed to. 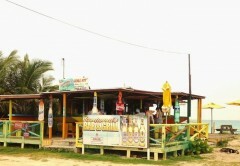 An extremely popular beach side bar with yachties and tourists. 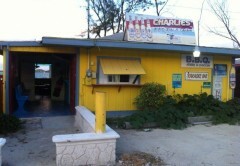 They offer a simple menu of ribs, hamburgers and fresh conch salad along with some strong libations. On Sundays they host a pig roast which is one of Exuma’s social highlights. While you’re there, take a moment to feed the local sting rays or watch for the dolphin family that lives in Elizabeth Harbour. A lovely spot on the hill overlooking Elizabeth Harbour just north of Chat N Chill. Friendly service and great food. 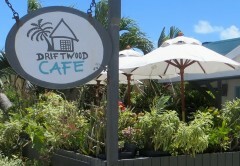 You can easily enjoy a great lunch here and then walk/wade over to Chat N Chill for some beach time fun. Good to know:Please note that the information contained is for general information purposes only and does not constitute legal or other professional advice or any subject matter. !!! Open hours and working days are subject to changes and local holidays. We suggest to call first before go to any restaurant!! !